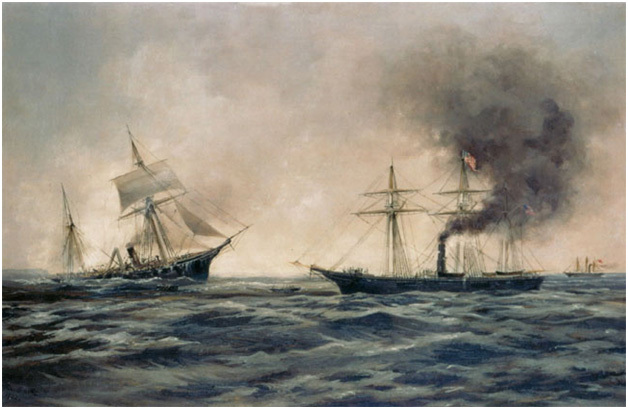 On June 19, 1864, one of the most celebrated naval battles of the American Civil War was fought not in Southern waters, but on the other side of the Atlantic. It was a long awaited duel at the end of a long and frustrating chase that came to a climax off the coast of Cherbourg, France. Two ships—the notorious Confederate commerce raider Alabama faced the U.S.S. Kearsarge in a fight to the finish. Bob’s program was accompanied by maps, period pictures, and illustrations of the two ships, and comparison charts between the ships themselves, their armament, and their respective captains. Robert E. Hanrahan, Jr. is a founding member of the Confederation of Union Generals, and has a long history in the Philadelphia area civic and business communities. He received his undergraduate degree in marketing from La Salle University, and is currently a retired consultant in the information technology field. Bob’s late father (Robert E. Hanrahan Sr.) served in the U.S. Navy during World War II as a seaman 1st Class aboard the Battleship U.S.S New York, which engaged in numerous actions including the battles of Iwo Jima and Okinawa. Bob is also an active participant and member of the United States Naval Institute, including the Arleigh Burke Society and the Commodore’s Club. During the Civil War, Bob’s Great-Great Grandfather James Murphy, served in the 20th P.V.I. and 6th U.S. Cavalry. Bob’s other present interests include his involvement with La Salle University as a member of the Presidents Council, Investments Committee Member of The William Penn Foundation; InspiriTec, Board Member; President of G.A.R. 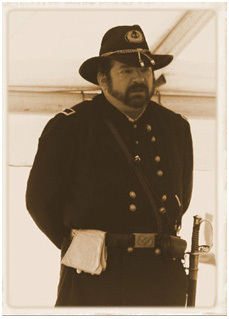 Sons of the Union Veterans Camp 299, The Heritage Foundation: Washington, D.C., Presidents Council Member; Gettysburg Battlefield Preservation Association, Board Member; Majority Inspector of Elections: Precinct 249, East Goshen Township, PA. The Longport Historical Society: Longport, NJ, Trustee, and Past President. The Civil War Preservation Trust, Friends of Historic Goshenville, PA, and National Republican Party. Bob lives in Chester County, Pennsylvania, and has three children, Katherine born in 1985, John born in 1986 and Dorothy born in 1988.